If you are about to open a small business with a partner, there are some special things to account for that single proprietors do not have to worry about. One of these things is the buyout agreement. Business partnerships can be tricky to navigate. 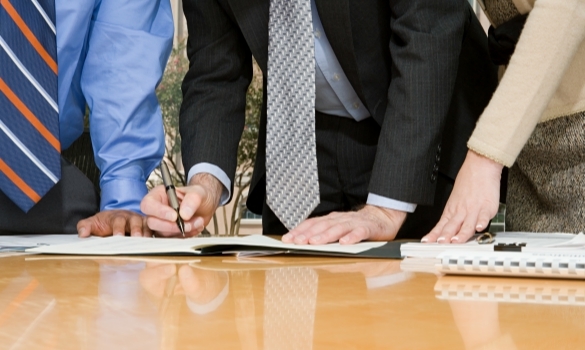 Make sure you get things in writing by creating a buyout agreement. These documents are sort of like liability insurance for business partnerships. Find out what to include in your legally binding document below. First and foremost, business buyout agreements need to include all the different possible withdrawal events that would cause a stakeholder to want to be bought out of the business. There are a multitude of reasons that a business partner would want to buy out of a business partnership. You want to be sure that your buyout agreement accounts for all those potential events. These events could include divorce, resignation, bankruptcy, insurmountable or delinquent debt, death, disability, termination or retirement. Make sure that you create a document that effectively plans for all these possible events. Doing so is the only way to create an effective, legally binding business buyout agreement for business partnerships. The first thing to decide when drafting a buyout agreement for a business partnership is which structure you will follow. Cross purchase buy sell agreements allow for remaining owners to buy out any departing co-owner’s ownership interest. Redemption buyout agreements only allows the business itself to reclaim that departing owner’s stake. Make sure to decide which type of buy sell agreement you will be using, so that you can start picking the best merchant services for your business much sooner. The next thing to include in your buyout agreement is, of course the parties involved. You want to be sure to account for ownership percentages. Identify each co-owner of the business and their respective ownership percentage. This should be an obvious item to include. You do not have to include anyone else, like the patent attorney you first worked with on one of your products. However, it is always good to have a reminder. You want to be sure that any buyout agreements you create include triggers that will set the agreement into motion. These triggers can include retirement, death, disability, divorce, debt or any management issues. Try to identify all possible triggers that you want to be included in your buy sell agreement in order to protect your business from all future possibilities. This is a crucial component of learning how to form an LLC. A business buyout agreement should also include the procedure that is to follow once one of the triggers occurs. This could mean the procedure for how one co-owner will buy the other’s share. It could also refer to the process of the business entity itself regaining ownership of that stake. In any case, make sure to set the terms of how the sale will happen in the case that one of the triggers happens. This should be done almost immediately following your decision to form an LLC online. Obviously, you must also account for the price of the buyout and the way in which it will be paid for. The price of the buyout will depend on several factors, such as market conditions and the particular buyout trigger. The funding sourced for the payment, however, should be static. Decide if the other owners are responsible for their own payments or whether you will have an insurance policy to cover those buyout expenses and the manager training it will take to replace crucial business roles left vacant from the transaction. No matter what you decide on, listing the funding sources and buyout valuation is essential for a functioning, legally-binding buy sell agreement. If you are the part owner of a small business, you should definitely create a buy sell agreement, sometimes called a buyout agreement. This agreement will help protect the business and all owners in the event of retirement, death, divorce or other occurrences. Make sure to include the specifics listed above in order to create a functioning, legally-binding document. You are sure to be happy you did so later on down the line.